UPDATE: THIS EVENT HAS BEEN POSTPONED TO AN UNKNOWN DATE IN AUGUST DUE TO THE ASEAN SUMMIT MEETING IN KL. 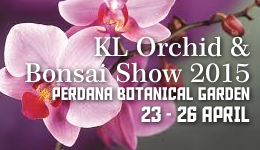 Just a little reminder for Flower Shows/Events this month, the KL Orchid and Bonsai Show 2015 is scheduled for 23 April 2015 - 26 April 2015. The venue is of course the KL Lake Gardens, or now known as Perdana Botanical Gardens. Alamak busy weekendlah pula have wedding and Ilhan have hari sukan.